Not so long in May 2015, I was asked this question by my potential employer. “No thanks, I would like to have a feel of the country first” I said. Now, that does seem like an odd choice, but I had my reasons. I’ve been a traveler for a long part of my life and I wasn’t so sure that I would stick around long in New Zealand, besides applying for a work visa seemed so much easier than a resident visa. The rules were simple and as long as you had a job, there wasn’t a lot of hoops to pass through. The process was quick and within a couple of weeks, having completed my medical and paperwork, I was granted a shiny new sticker. Now as I was boarding the long flight, the thoughts of whether I should have bid my time and got a resident visa flickered through. The idea did cross my mind a few times. The idea to get a resident ASAP came to fruition when one of my colleagues finished his contract. The Immigration in New Zealand, demands that the applicant be on a visa at all times. This is different to say the UK. In the UK, as long as your application has been formally accepted by the home office and you have a letter from them, you are entitled to be in the country even if your visa expires. Coming back to my colleague, Daniel had finished his contract and the Immigration demanded another work visa before applying for a resident visa. And then started my efforts towards a Resident Visa. “Should I apply with an immigration consultant ?, Will my job be accepted not being on the occupation list?” were some questions that popped through my head. My visa got approved within 3 months, counting that one month was a holiday, that did take my mind of the process, but it did make my application pick up dust. Your EOI points in excess of 140 with a job offer makes your process so much quicker. If you’ve completed a Medical previously for New Zealand immigration, the Medical is valid for 3 years. Immigration New Zealand would require a permanent position to be mentioned in your employment contract (if your ever claiming points for that) —- My contract said “fixed term for 23 months” and my case officer wanted my company to correct the contract to “permanent employee” effectively changing my contract. You will have to work for a period of 3 months with your current employer if your offered residency from outside NZ. You need a lot of patience and hopefully things should be fine. Resident visas lets you access to public funds. It allows for greater mobility in New Zealand, your no longer geographically tied down to a single company. 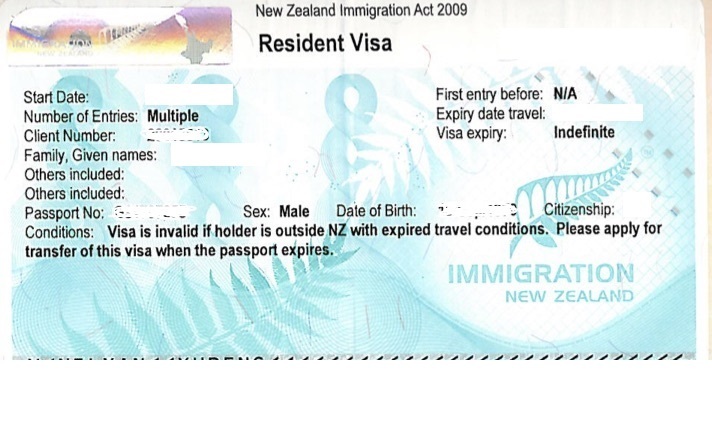 Resident Visa is indefinite within New Zealand. In order to have indefinite travel conditions you would need a Permanent Resident Visa. Allows you to sponsor parents, spouse, children. This sounds very great. I’ve been living in New Zealand for the past one and a half years but only on a student visa. I would love to get a proper resident visa because I just want to stay in this country but I don’t think that’s possible. Have you ever heard of someone getting a resident visa before they finished university? Hi Kristina, I believe you will have to complete your studies and then you could have an open visa that would allow you to work for any employer for 2 years I believe, but no you can’t get a resident visa when your still a student. We had a few graduates joining us who were granted open visas based on their Bachelors in New Zealand, but that isnt a resident class visa. Whats your field of study ?? I’m doing a degree that’s called a Bachelor of Creative Technologies. I think that should definitely qualify me as a skilled worker once I completed it. I also believe that regulations for me are a bit different because I’m not from the UK. I believe that I will have a year after completing my degree to find a job in that field and if I don’t I will have to leave the country. You would have to gain in excess of 140 points to automatically qualify from the pool. From the research I have done, its extremely difficult for people without a job offer and less than 130 points or so to be offered a resident visa. But its a different story if you have less points and a job offer, at least that’s what my research taught me. Did you try the point calculator, how many points did you claim ?? At the moment hardly any but for after I finish studying I should have enough. I don’t quite remember how many but I defiantly hope that it will do. Of course it would be even better if I was able to get a job straight out of uni. So how’s life now in NZ?